That’s Earth, photographed from some 898,410,414 miles (1,445,851,409 km) away, by NASA’s Cassini spacecraft. This photograph (and a few others) has been making the rounds on the internet. And it’s not hard to understand why. There’s a primal sense of beauty and awe in the experience of fragility and smallness, in being dwarfed by, yet being part of utter vastness. And in a globalised, warming world of nuclear weapons and financial crises, where that sense of fragility is stronger than ever before, a photo such as this resonates on a deep level. It’s a humbling picture. It puts some important things into perspective. Aaaand it proves that life is insignificant and utterly meaningless. Right? Because that’s a feeling a significant part of the coverage of this picture has registered. Take TechHive’s article, which asks, “Want life to feel pointless? 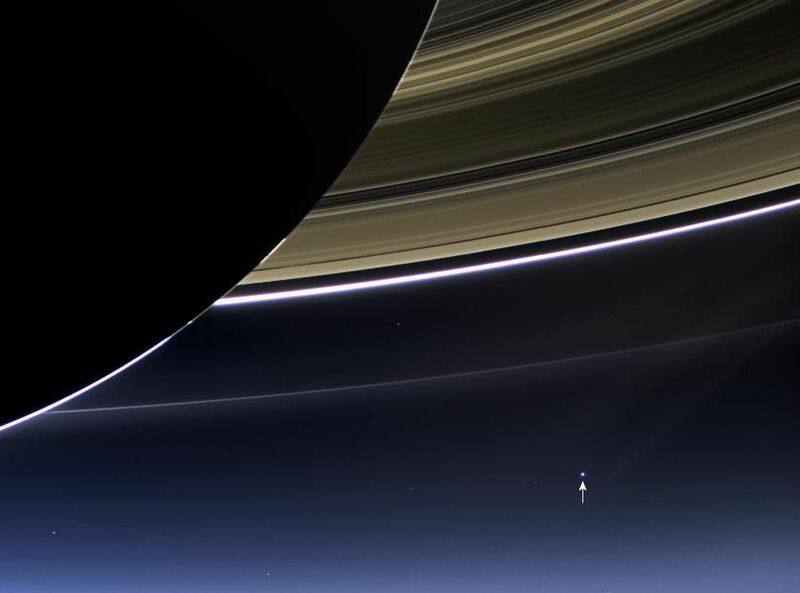 Look at these photos of Earth from 900 million miles away”. It’s assessment of the picture? It’s simultaneously stunning and a little depressing, actually, to think that you exist on nothing more than a tiny, pale dot. Like ants on the sidewalk, almost. We are very small. Our problems, worries, concerns and joys, from our birth to the minute our souls are extinguished, are merely infinitesimal specks of time and space anchored to the cosmically insignificant rock we call Earth, floating free in a sea of darkness so vast the human mind pales to comprehend even a fraction of its size. it makes us seem so insignificant. There are probably thousands and millions of earth type planets in our Galaxy, each bearing new life and civilisations. prehaps similar, or completly different. and here we are, thinking we are the only one and omnipotent, where we could be so far behind in comparison to what else is out there, as we have only our self to compare with and not any other life……its so…captivating….. But where did this idea come from? Why would the size of the universe have any bearing on the significance of individual human lives?If the universe was half the size it is now, would life be twice as significant? The idea is absurd, even if the feeling is wide-spread. Nor do extra-terrestrial civilisations diminish the significance of terrestrial ones. By that logic, your personal significance would increase in proportion to the number of people you murdered. As a Christian, I believe that human significance is not based on our place in the universe, however vast it happens to be. Human significance is ultimately based on God’s loving regard for his creation. In Acts 17:28, Paul says, “In [God] we live and move and have our being” – our being and our significance. Whether we are alone in the universe or, as seems more likely, we are not, and whatever the size of the universe, our significance as people is our significance as God’s creatures (and this would be true for whatever aliens might exist out there). That’s where it comes from; not the size of the universe. And remember that the human brain remains far and away the most complex structure yet known in the universe.